Last June, I got the chance to work with Hilton Worldwide to revamp the The "Legendary" Beverly Hilton website. The main focus for the project was fix the accessiblity issue on the previous site, along with developing a new art direction . We started from scratch and took the time to make sure each of element of site are fully flushed out. Conrad Hilton opened the Beverly Hilton in 1955, it was designed by Architect Welton Becket. The Beverly Hilton has been an icon in the history of Hollywood and its the home the Annual Golden Globe Award. Its one of the Hilton property that has its own distinctive branding outside of it’s corporate identity. As the sole designer on the team, I oversaw the entire design of the product from the initial UI concepts all the way to pre-development stage. I had weekly meeting with the team members along with monthly feedback from the product stakeholders. Our goal was to bring the site to a new modern look and feel, but keep the elegance of the Hotel's historical background. Project Manager: Shannon M. & John L.
During the initial development phase, we listed numerous critical elements on why did the previous site is in need of a redesign. We listed a bunch of features and ideas, but end up with three essential elements that we wanted to tackle. Contrast Ratio: Color can make or break a site. One of the major issues of the previous site was its contrast ratio between the font and the background. We want to stay within the same family of colors, but the colors have to be 100% compliant with the ADA standards. Navigation: Navigation is the critical element in any redesign. We paid particular attention to the booking widget, which will we go more in depth in the design process segment. Composition: My goal for the composition was to make the page cluttered free, that each UI elements have room to breathe, which makes the user easier to focus on the content. 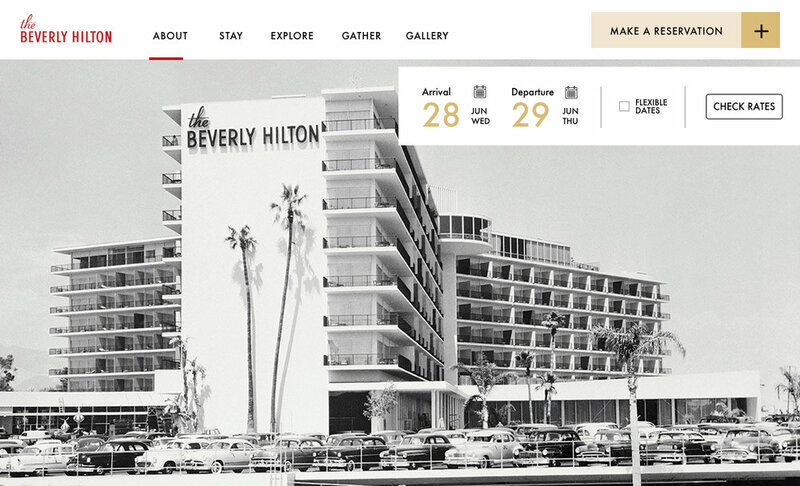 One of my main contribution in term of the design was coming up with a brand new homepage for The Beverly Hilton. We started with simple lo-fi wireframes and worked our way up to mocking up the entire site in Sketch. The major issue I had with the previous site was that all the UI elements feel cluttered and its hard for the user to navigate around the site. We expanded the Hero Image to full-screen size and rethought the UI Navigation for the Booking Widget.